The Security And Safety of Your Belongings Is Highly Important To Us at Eden Way Storage Center in Chesapeake! When you are choosing a place to store your furniture, boxes, vehicles, or even vessels, safety is always the main concern. At Eden Way Storage Center our customers can relax knowing that their belongings are in one of the cleanest facilities designed with safety in mind. State-of-the-art security cameras allow us to ensure that your storage unit is secure. Our Storage is monitored 24/7. And, our Chesapeake facility also offers safety call buttons should you need assistance when accessing your self storage unit. When you choose Eden Way Storage Center in Chesapeake, we have a free move in truck you can use – absolutely free of charge – and we provide a lock for your unit. You’ll find a spacious loading bay, excellent lighting, wide elevators and hallways with enough room to make it easier for you to load and unload your self storage unit. Come visit our locations at Eden Way Storage Center in Chesapeake and Tidewater Drive in Norfolk to see for yourself why you’ll want to use our self storage facility. We take pride in keeping your possessions safe. 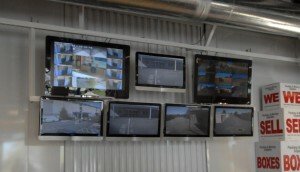 To ensure the highest security of your storage unit, our facilities are equipped with video surveillance cameras. We have computer controlled gates, doors and elevators, allowing only current tenants and authorized employees with a code to enter. Every entry and exit is logged on our computers. To make sure that your items are safe and secure we have reinforced door latches combined with a high-quality lock. To ensure the security of your self storage, our bright interior lighting is triggered by motion detectors. Our conveniently located intercoms in hallways and elevators, allows you to speak with the manager during office hours. Our professionally trained staff regularly inspects the property to make sure that units are locked.